GRAVENHURST — For decades the downtown here has been defined by its one main block — between Bay and Hotchkiss street — where much of the commerce has been centred. North and south there are and have been many fine stores. But now, some hard times are ending and there’s tilt to the north again, with three new businesses opening up new business territory. The Brick has bought the former Mac’s convenience store, the Relish Café owners have bought the original Salvation Army Citadel next to the United Church, and the Elephant’s Trunk is moving into the former Aiken Christensen and Heath office. A big move for the downtown is the addition of The Brick, a furniture and appliance store moving into the former Mac’s Convenience store. It’s a lot of optimism for the BIA and its merchants in the neighbourhood. The Brick is a particularly big step for the core sector, one that is a big chain that usually opts for malls — and is not a small service office as has been the general trend of small towns for years now. Contractors have papered over the windows on the large building that was a busy 24/7 milk store for years until about a year ago. It is just north of the post office. 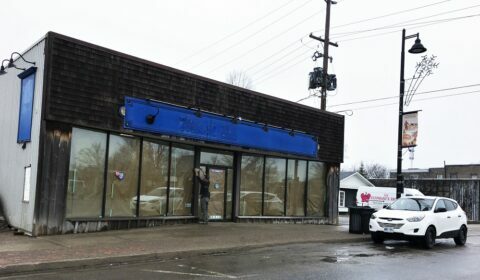 They were in there Monday beginning work on renovating the property for the home furnishings and appliance store, which will sell furniture, appliances and home products. Ron Jacques, the franchisee/owner of the Orillia Brick, said he is excited about opening his new store for the summer this May 17 Victoria Day long weekend. He says they’ve been in the 2,800-square-foot building for a week now and it should be ready to open in six to seven weeks. It’s gong to be a “whole new concept” of a Brick Store, he told MuskokaTODAY.com on Monday. “You’ll still be able to walk out with what you see” — with maybe some of the larger items that have to have brought in. The Sparrow Lake cottager “pitched the idea to corporate” and they loved the thought of moving into downtown Gravenhurst — rather than a mall — to attract local shoppers and catch the summer cottage owners. He said the local economy is good and things are looking up for The Brick. He said his stand-alone store in Orillia, on Hwy. 11 next to the West Street Mall, has been the chain’s top seller for four years now in terms of sales growth. Meanwhile, next door, Ken Schwabb of the Elephant’s Trunk has bought the former lawyers’ office from the Christensen family, after Crown lawyer Peter Heath moved out. Schabb’s lease a few doors north at his current location ends in June and he expects to hold a clearance sale this spring and then move the rest of his goods to a large storage barn behind his new property and operate a storefront out of the small office building, in which behind he will reside. After 21 years, he wants to downside a little, going from 3,000 square feet down to 1,200 feet. He was painting the new place Monday an already has a sale on of “30 to 50 per cent off” – all tax-free. He was also a town hall today seeing about its facade improvement and handicap accessibilty programs. After 21 years, Ken Schwabb is downsizing and will move his business a few doors south this June. The old video store building next door is still empty. And across Muskoka Road from where Schwabb is now, Emily Dursley has bought a new building and plans to re-locate the business there after a couple of years serving soup and sandwiches and more in the fron space at the front of the Gypsy Mew, which moved to the Wharf this winter. Deliveries have already begun there. It’s part of a regular urban renewal, one that also sees the former Gypsy Mews building across from the Opera House to be given a new life itself, with Kim Barnes, owner of the Butcher’s Daughter, about to occupy the whole space for a larger sit-down deli cafe. And nearby, Rombos Pizza is undergoing a facade improvement with new siding. It all adds up to an optimistic summer for the downtown. The Relish Cafe is moving north to the old Salvation Army Citadel after the Gypsy Mews sold and moved to the Wharf this winter.